Two weeks into physical therapy and I am feeling OK. Well, the shoulder is supposedly making progress. Not that the pain is gone completely. I thought I would be able to ride it all out, maybe without having to use a lot of my tools to get through it. But the elation of having my physical therapist, Drew, tell me it is treatable and that it will be feeling better over time, has given way to frustration when progress I thought I was making seems to stall or, worse, take a step backward. I have been dutifully following Drew’s instructions and working on posture, doing the exercises on the printout they gave me on Day One. But at the end of each day I become impatient. I get that if I was not following orders, progress would be elusive. But I am doing all I can, and it’s not happening fast enough for my tastes. Impatience, I see it often in my clients. It’s one thing to tell them, “It will take time.” But to tell myself, quite another story. I am grateful to have a physical therapist that is patient and doesn’t mind answering question after question. Knowledge is power, and I want to be powerful in this battle with my pain. Drew has a great sense of humor, and I find that laughter is indeed pretty good medicine. I think he uses the humor as a way to distract me from the havoc he is wreaking on my shoulder. Nice try! Not sure why the cure is sometimes worse than the disease when it comes to physical therapy. But I have been assured everything they are doing and having me do is for the greater good. I realized that beyond “no more pain,” I didn’t really have any particular goals set for my rehab and recovery. This surely precipitated my lack of motivation and feeling that I am a victim of “two steps forward, three steps back.” I asked Drew what our goals are, beyond eliminating the pain. He hesitated a bit, admitting that for my particular case there really is no quantifiable goal beyond the lack of pain. I have full range of motion, albeit painful at certain angles. So that is where we decided to start. I need to be able to quantify my progress. Drew has made note of what angles of the range of motion cause pain. Also, certain activities such as holding my arms out to the side when skating, are painful 100% of the time. The idea is that I will keep track of angles and timing and hopefully start to see improvement that can be quantified. Eventually the pain will be less at those same angles. Eventually pain when skating will be reduced to 90%, 75%, finally 0% of the 90 minutes I skate in a session. While not terribly scientific, it did satisfy my need for goals to shoot for. I am incorporating some imagery into my home exercise routine, to help me get past the fear. I visualize myself skating without pain. I see myself doing push-ups without fear. I imagine the muscles of the rotator cuff getting stronger, smoothing out and pushing out the pain. There is a pain relief cream called Blue Emu, which I learned about from my father, a massage therapist. It really is blue. When I first used it, my son was intrigued by the name of it. He helped me form a visual of how it works. “There is an emu in it who pecks at the pain.” Love it. More on imagery and “pecking at the pain” next time. "Don't go to the doctor!" But the shoulder pain has become unbearable. "Just don't go to the doctor!" my skating coach insisted again. I always know he has my best interests in mind. "Because he will just tell you to stop skating." "Well what if he's right? I have to feel better. It's just too much now." "He's not right. Pain is just part of life now. You are older, you will have pain. You can still skate." Whoa, he played the age card. No fair. Still, I know I have endured numerous minor aches and pains regularly for years, figuring they will likely be with me for the remainder of my "older" adult life. But this pain has become unbearable. It wakes me in the middle of the night, begging for attention. I have invented a hundred "workarounds" to help me dress, open the car door, put my hair up, even hug my kids without pain. I decided to ignore my coach's pleas, and made an appointment with renowned shoulder expert, Dr. B. After a series of x-rays and an office visit filled with excruciating movement study ("do you have pain when I do this? "), my diagnosis was shoulder impingement and rotator cuff tendonitis. Basically a ton of inflammation and parts rubbing rudely against other parts that have no business being rubbed. His prescription for now is anti-inflammatories and some physical therapy. Day 2 and so far not much has changed, pain-wise. I will start the physical therapy on Monday, which will be Day 6, so hopefully the meds will enable me to do some exercises with much less pain. OK so that is the back story. Now for the lesson. It's a lesson for me. It's my job, my passion, to help injured athletes successfully navigate the sport injury rehabilitation process and come out confident and ready to return to play. All the knowledge in the world does not compare to knowledge plus experience. I am ready to experience, ready to practice what I so fervently preach. Thought I would share with you as I go. It's not going to be easy, as you can see from my coach's reaction. In the past, I have had sports injuries. Of course I have. Any athlete can point to any number of dings, sprains or breaks they have had. When training for the Marine Corps Marathon one year, my spirit was willing, but my achilles was weak. Had I continued to train it would surely have ruptured. I endured rehab and came back, though I did miss the marathon. Poor timing. So I have past experience to tell me that I will get through this, I will return. At that time, however, I did not yet know about the mental tools I could have used to help me. I struggled instead of taking control and thus did not fully regain confidence in my ability to run long distance. Another difference between then and now was that I was an individual, training on my own and not with a coach or team. I did not need to please anyone with my progress but myself. There was no timetable beyond my control for my return. Now, I have a coach. And the pressure he exerts is far more than I imagined it would be. It's not like I am training for the Olympics, but I must say I have made significant progress in my skating this year, and who knows what the future holds. To my coach, though, Olympian or not, train through the pain is the mantra. Granted, Dr. B did not specifically say "don't skate." He did say quite obviously, "If something you're doing when you skate causes pain, it might be a good idea not to do it for a few weeks to let the medication and therapy do their job." Like many of my clients who hear these words or face the cessation, albeit temporary, of a loved activity so integrated with life, I immediately began to figure a workaround. I can still skate, sure, but I just won't use that arm. Sure, that will affect my balance, my ability to use my shoulders to guide my turns and edges. But is that so bad? Practice what I preach. I need to do this right, if for no other reason than to prove to my clients I get it. And that the tools we use during their rehab do indeed work. So here I go. Even though my injury was not due to a trauma but was gradual in onset, there still came the moment when I knew enough was enough. Yet I was still unprepared to consider taking a break from skating. I did not understand exactly what was happening to my shoulder. There was a feeling that my shoulder was betraying me. As athletes we are very in tune with our bodies. We know how they move, know how to direct them to perform. We know what feels right and what feels wrong. We have the sense that we are in control of our bodies. So when an injury occurs, we may feel we are losing control over our bodies. So first things first, I set out to understand from Dr. B what exactly was happening without me. He is an amazing doctor, very patient and knowledgeable. He showed me a model of a shoulder, demonstrated over and over what was going on in my shoulder, and what needs to happen in order for the pain to go away. I plan to take this information into the next phase, when imagery will really come in handy. Did you catch the NHL All-Star weekend festivities? I loved it all. 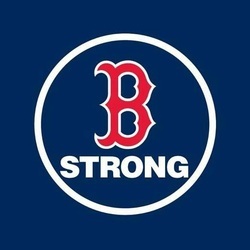 Not just because I am a huge fan of hockey, but because I am also a fan of the human spirit. Sure, there were some amazing examples of just why these guys are masters at their craft. I certainly would never volunteer to stand in front of a Shea Weber slapshot no matter how much padding I had on. And Evgeny Kuznetzov, the Wizard of Washington, is a delight to watch as he snakes around and through crowds to put an exclamation point on an impossible pass. I was more interested, though, in the personal stories that emerged from this year's celebration. The most obvious was that of John Scott, underdog fan favorite who, despite urging the fans to "vote for my teammates," won a place on the coveted roster. Within two weeks of that news, he got word he was being traded from Arizona to Montreal. Montreal immediately sent him down to the minors. No stranger to such abrupt changes, Scott handled it like a true professional. The NHL, however, was conflicted. How could he compete at the All-Stars now, and as a team captain, no less? In the end, Scott was allowed to join in. He not only joined, he shined. He scored two goals and emerged as MVP of the game. Fans adored him, even his fellow all-stars cheered and encouraged him. They hoisted his huge frame (about 7' tall on skates) on their shoulders, as he beamed. If you're interested in Scott's account of events leading up to the game, read the article he wrote for the Players Tribune, "A Guy Like Me." It's both touching and inspiring. Young fans everywhere should take notice of the sportsmanship on display. The fact that all of these egos were able to play nice together is encouraging. One player remarked when asked about the $1 million prize for the winning team, "I don't think any of the guys are playing for the money. It's a pride thing." I can believe that; surely none of these guys are hurting for pocket change. Pride is a powerful motivator. To be a superstar, you must take pride in all you do, in the way you prepare, the effort you give in practice, the devotion to the game and to your teammates. Pride allows you to be confident you are performing at your best at all times. You won't allow yourself anything less. John Scott should feel proud of how he handled himself. He was rewarded for his humility, his effort and determination to prove that he deserved to play alongside the best in the league. Even if only for the weekend. But for now, that is all that mattered. Robert Griffin III probably thought social media was the key to his connection to his growing fan base when he first came to Washington. He happily shared his thoughts about his opportunity to play for the Redskins, his workouts, his expectations for himself. His Twitter followers gobbled up every tweet and responded with overwhelming positivity, encouragement and support. At the mention of his pending nuptials, fans everywhere flooded his home with gifts from his and his fiancee's bridal registry. The humble and grateful gentleman hand-wrote hundreds of thank you notes to his generous fans. When the unthinkable happened and Griffin found himself under the knife, fans rallied on social media with words of encouragement. Griffin shared his personal recovery timetable, goals and struggles. I, too, was very interested in his discussion of his mental recovery (RGIII's Mental Game). Social media, however, can be a double-edged sword. Even as it nurtured and lifted the bonds between favorite athlete and appreciated fans, it soon served as a method of slow, methodical destruction when the going got tough. As Griffin's return proved more difficult and a second injury and rehabilitation effort hampered his efforts to be the exciting dual threat as per his billing, comments and debates ensued. Negativity grew. Griffin, for all of his humility and affability, could hardly hide the hurt he was beginning to feel with the backlash. He is human, after all. Study after study shows negative comments far outweigh positive when it comes to what our human brains attend and hang on to. It takes at least 10 positive comments to soften the blow of one negative. For Griffin, the positives fell far short. The change in Griffin's once engaging and humorous larger-than-life personality had become painfully evident. If only we could tell ourselves, "Who cares what people say or think" of us. But sometimes that is a bell which cannot be un-rung. Athletes who elect to put themselves out there on social media need to prepare for the inevitable bad that goes with the good. Prepare for how to handle and process what come in. Ideally, refraining from reading comments would keep negativity away, but we all know that is nearly impossible. A bit of perspective is required. Remember that for the vast majority of "followers," social media affords an anonymous identity through which anything can be said without consequence. But for the celebrity athlete, such anonymity does not exist. Responses and reactions to negative anonymous postings should be kept to a minimum. Athletes should strive to portray themselves in a positive light. Social media is a great way to do this, if done properly. And while it is great to feel the fans love, it must be taken for what it is--anonymous, conditional, and often, fleeting. Athletes must decide who in their lives are truly important to them, whose opinions matter, who is really there for them. Anything and anyone else cannot be of great influence. It is the only way to protect oneself from mental anguish in bad times. RGIII will bounce back. He is a proven warrior, who has beaten the odds with his style, and has impressed and entranced thousands of fans with his humanness. But the only one he really needs to fully support him is himself. 1. Coach Trotz is meticulous, detailed and highly organized. His every move is calculated and deliberate. From start whistle to finish, everything is done according to plan. When this is communicated to the players, there is trust. No surprises. He tells them what they will be doing and when, and that is what happens. 2. He has assembled a team of coaches and staff who he trusts to work at a high level, who buy in to his vision and own it. These individuals are at the top of their respective areas. Mitch Korn, for example, is a guru of goalies. His style and original training props (mini-pucks, white pucks, a curtain of hanging strips and more) simultaneously raise eyebrows and inspire motivation to perform among the players. The consistency among the coaching staff in their approaches to training and play is necessary to maintain credibility and trust of the players within this system. 3. Coach Trotz has a clear vision and philosophy. He communicates this to his players verbally and by example. He communicates his expectations for the team and expresses confidence that the players can meet and exceed these expectations. His belief becomes their belief. 4. Coach Trotz nurtures the team atmosphere, the "we're in this together" feeling. He personally invited select players to form a leadership group. The group members are players who can lead by example on and off the ice, who can help teammates manage their emotions so they don't get in the way. They can ensure everyone plays as a team. If there are issues, players are encouraged to speak to the leadership group, which acts as a middleman between players and coaches. Leaders were paired as mentors with rookies at training camp, even assigned locker stalls next to one another to further drive the point home that they are all one, all part of a greater whole. Everyone matters. What these things have done is to break down barriers common in teams--veteran vs. rookie, superstar vs. fourth-liner, management vs. player. It has produced an atmosphere in which they have not just a team, but a band of brothers. The players want to play with and for each other. They have each others' backs and support each other. They fight for each other. Now out on the ice, whether they're a first- or fourth-liner, it's personal. And they're all in. I'm sure everyone has been wondering, "How is Christie's skating coming along?" I mean, it's been 2+ years of lessons now (one 30-minute lesson per week--summers off--and three 90 minute skating sessions per week--again, summers off). So it's time for a check-in to see all the amazing progress. 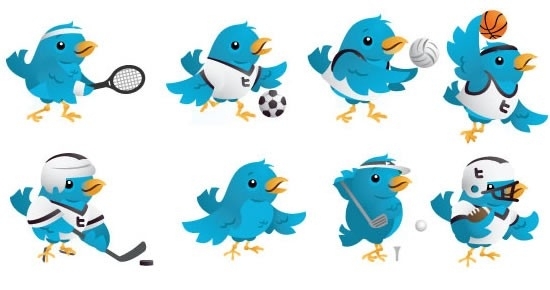 I have been applying principles of sport psychology, using my mental tools to help me learn and develop skills, mentally rehearse and perform with confidence. One tool I had purposely neglected to use--and I had my own good reasons--was videotaping my practices. While videotaping practices and performances has a number of very positive uses for athletes, for me, the idea of possibly seeing that the reality didn't match the beautiful fantasy in my mind, was a slope as slippery as the ice I magically sail upon. 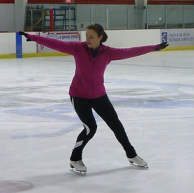 Content to use observation of other skaters and my coach as my examples of proper execution, my visualization practice involved seeing myself and my skating from a first-person point of view. I would see the ice, the rink, my skates, from an internal perspective, not third-person the way I actually appear to others. In my images, I perform the skills just as I've seen others perform them. This has been effective in learning the basics, improving my confidence on the ice, and helping the movements to flow a little better. Eager to share my incredible accomplishments, I invited my husband and kids to the rink so they could be blown away by my progress. My husband brought out the video camera, and for once I was OK with it. When I finally watched the video, however, I realized the person on it was not exactly me, or the me I'd imagined in my head. There was definitely vast improvement but I could pick out a lot of things I was not doing well, to put it kindly. The confidence I felt on the inside when on the ice did not show on the video. At first I was devastated by the disconnect and wanted to just throw in the towel. After all, this is just a hobby. But the competitive side of me--and the sport psychologist--searched for the silver lining. I have reached a point in my training where I can stay stagnant or make a great leap forward. It's up to me. I can now integrate video into my active toolkit and make it work for me at a level it could not have when I was a mere beginner. The key for me is to watch with ego firmly detached, and observe from a perspective of learning, tweaking, perfecting. Rather than blissfully practice skills "slightly wrong," when I'm on the ice, I will focus on the aspects of each move and how to perform them perfectly. Practice makes perfect? Only if it is perfect practice. It will require taking a few steps back in order to bound ahead. I actually look forward to getting back out there and practicing with renewed focus. I look forward to my next video, too. Never thought I'd say that. Third Place! Or, "second loser." It's all in how you look at it. For many years, attempts have been made to just do away with the third place game in the World Cup. The players agree they come to the World Cup to win. Anything less, pun intended, is no "consolation." Teams vary as to how they have approached the game in the past. Some have even managed to let loose and have fun. Let's look at this year's contenders and how they approached the game. Brazil likely wanted to just get it over with. But they had something to prove. To their fans, to themselves, to their country. They saw in this final game an opportunity to prove they were more than the sum total of the goals against them in the semifinal against eventual champions Germany. The Netherlands, on the other hand, apparently didn't want the hassle of changing their return plane tickets home, so reluctantly agreed to stay and play the game they supposedly love one...more...time. Something like that. I'm sure the fans who spent the money and took the time to travel great distances to wear the orange (and I do mean orange--see under, "whoa, that is a bright color! We will be seen!) or to "root, root, root" for the home team, appreciate the players' acquiescence. But don't they deserve more? What is it all really about, anyway? Is it about young men who have loved the game for their lifetimes and dedicated themselves to playing and perfecting their craft? Men who would do anything just to be out there playing? Is it about the fans, people who may have their differences at home, but who can come together in harmony to share whatever comes as one collective entity, cheering, celebrating, jeering or consoling? As soon as you hear comments from the players and coaches voicing their disdain for anything less than victory, it makes you wonder. It makes me wonder where along the line the values we try to instill in our young athletes have gone off track. "Winning isn't everything" has become, as Dutch coach Louis van Gaal so bluntly put it, "There's only one prize, one award that counts, and that is becoming champion. This match should never be played. Teams don't want to play for third place." Dutch forward, Arjen Robben added, of the possibility of a third place medal, "They can keep it." It is disappointing to know now that the team who had some real emotion in playing, some motivation, was left with nothing. Brazil wanted to be professionals, to show their character. It didn't manifest in a win, but I give them credit for their attitude and drive. In the face of semifinal humiliation in front of their home crowd, they took their consolation game as a challenge and opportunity. It will sting for a while, but hopefully they can find a way to be proud of themselves. These teams on the world stage may not realize it, but they shoulder the burden of being an example to millions of young soccer players around the world. The way they play, the laughable dramatics and showmanship, the incredible skill and athleticism, all are being scrutinized and internalized by these young fans. As heartwarming as Brazil's David Luiz's show of good sportsmanship toward Colombian player James Rodriguez was, I have to wonder why it stood out so much--I guess these types of moments are few and far between, which is unfortunate. But that image will stay with the next generations and that is the real heartwarming part. Thank you, Netherlands, for finding it in your hearts to play one last game. Next time, be bigger than your egos. Think about who might be watching, who you can inspire with your play, your attitude, regardless of the outcome. Second loser? Only if you think it so. Get 'em next time Brazil. Your fans will be behind you as long as you stay true to why you play and how you can inspire. We haven't actually met, but I became aware of you the other day at the championship ice hockey game at the rink. Your son's team, "Purple," was playing my son's team, "Green" for the elite Squirt Division (9- and 10-year olds) championship trophy, also known (not commonly) as the gold star trophy. No fancy Cup named after anyone in particular, but a simple gold star. You first made your presence known when team Purple entered the rink. You cheered, loudly, dutifully, full of the pride a father feels (you know, the "that's my boy"-type) when his son is participating in a major sporting event such as this. Heartwarming as it was, it was immediately overshadowed by your lack of restraint in letting team Green know they were completely unworthy of sharing the ice with Purple. Your subsequent scouting report on each Green player in turn as they warmed up, need not have been within earshot of so many of Green's parents and Green players themselves. At last the puck was dropped and the game was underway. I suppose you thought your helpful hints and bleacher coaching went a long way, but alas, Purple struggled. You struggled. It seemed almost painful for you to watch the carnage as goal after goal was scored. Keep in mind, both teams were scoring and for the most part it was a rather even match. Had I only been listening to your play-by-play, however, I would have been outraged by the audacity of the 9-year olds who "refuse to play some D!!" or who couldn't "GET that guy!! Come ON! What is wrong with you?!!" Or worse, a kid who would have to sit in the box for a tripping penalty, only because the other 9-year old "totally SOLD it! ", actually falling down on purpose--not because the ice is slippery, or because he was tripped up by a stick--but to encourage the ref to make the call. "Come ON refs!!!" Your increasing agitation visibly affected all of us who had the misfortune of having chosen our seats in the stands so unwisely. As Green surged and my son scored his second goal, I felt an urge to cheer just a little bit louder, a little bit longer and a little bit more in your direction. Luckily, I reminded myself, I am a professional. And though it is extremely difficult at times to switch between my sport psychology hat and my Mom hat, I decided to instead exercise restraint and hope to be a good example for you. Not that you were searching for one. I turned my thoughts instead to your son. I wondered about what he feels as he plays hockey. Whether he finds it total joy, a passion, dare I say fun, or whether he struggles to please you. I wondered how things would play out at the end of the game when he exits the locker room. Will he be welcomed with a hug and a smile? Or given the cold shoulder, or chastised for not doing enough on behalf of his entire team and coaching staff to earn the gold trophy over the silver. Would he be subjected to a lecture during the long car ride home, or would he be offered a congratulatory stop for ice cream for his worthy efforts. Would he fall asleep later feeling alone and unworthy, or will he feel proud of himself, knowing he did his best, had fun, and has the full, unwavering support, love, encouragement and acceptance of his dear old Dad. And as he moves through life, will he approach competition and sports with trepidation or with passion, confidence, security and a sense that he can accomplish whatever he puts his mind to? Will he be a good sport, a supportive teammate and leader, or will he be in the stands shouting for all to hear about what what could or should have been? At the final buzzer, Green prevailed, the score 6-4. The kids from both teams scurried around the ice celebrating the game or just knocking their teammates down for fun like 9- and 10-year old boys will do. When the trophies were awarded, members of both teams applauded. For each other, regardless of team affiliation. The animosity was not there. It won't be there tomorrow at school when they meet on the playground to enjoy recess together, either. It was beautiful. I don't know how moved you were by their example. You stormed down the bleachers in disgust before the lesson could reach you. I only hope you can recognize the effect you have, and get a hold of yourself before it's too late. Deep down you have what it takes to encourage, to support, to be a good example. Please find that part of yourself and let it shine for your son and other people's sons and daughters. The impact you have on your son, positive or negative, will last far longer than a gold trophy. Keep it positive, and the rewards will feel like you've won the Stanley Cup. Only better. ﻿Tomorrow's Boston Marathon, the 118th, will make news for more than being the elite, time-honored event that it is for marathoners. This year's race will be a testament to individual fortitude and the collective strength of a nation. Over 5,500 runners (5,633, to be exact) who were unable, by circumstances beyond their control or worst imagination, to finish, were invited to return this year to race again. Those are the runners who are digging just a little deeper, questioning just a little more. The joy of running, the elation of competition, the thrill of pushing your body beyond its comfort zone and coming out on the other side in an altered state of consciousness or "flow," these are all now being compared to the grim reality that even intense preparation cannot ensure any particular outcome. "Is it worth it? Can I even finish this time? What if...?" No, we cannot control the insanity of others who may seek to disrupt the harmony of our lives. But dwelling on what cannot be controlled is only detrimental to ultimate performance. There are sights, sounds, feelings that cannot be unseen, unheard, forgotten. One should be mindful of these, allowing them to be, but not letting them interfere. Be aware that in this moment the thoughts are just that--thoughts constructed, reconstructed, replayed in the mind. They can appear easily but by the same token, can be dismissed as well. Trying to pretend they are not there in the first place is futile. But accepting their presence and willfully deciding to let them pass, replacing the thoughts for the moment with ones that are more positive, energizing, focused on the task at hand can help one renew their commitment to their ultimate goal. To reach that goal, these runners will be faced with the same mental and physical challenges as any other runner in any other race. Until that moment. There will come a moment in this race when an awareness of what was and what is will merge. At that moment, the true measure of the runners will be seen. My guess is that each one has already played through that moment in their minds, and decided how best to handle it when it comes. After all, these are athletes who consistently push themselves beyond where their minds want their bodies to go. Run 26.2 miles, when nothing is chasing you? Crazy, right? These runners have learned to push through physical and mental challenges to reach their goals. This will be no different, yet very different. No one would blame these runners if they couldn't push this time. But I don't think it will come to that for any of them. The inner strength they possess, the cheering crowds, the collective shoulders upon which they will be carried to the finish line--I predict this performance for each to be the greatest challenge, but more importantly, the personal best performance of their athletic lives. It's the Olympics, and the US athletes are expected to shine. A whole nation expects them to return next week laden with gold. But so far, expectations have been met with disappointment and questions. "What is going on?" we ask. Surely there is some conspiracy, right? Oh yes, the speedskaters' suits were to blame for Shani Davis and company's disappointing finishes. Or the Cold War is back and it's all on the Russian judges. What about the invisible tripwires on the skating rink? Even Mother Nature is in on it, laughing deviously as she brings summer to the Black Sea resort, turning the ski and sliding courses to slush. Ah, wait, maybe it's all in their heads. Our team, collectively, is losing confidence and mental toughness all at the same time. Or maybe...maybe it just is what it is. Anyone can win any race or competition on any given day, even at the Olympics. ("Do you believe in miracles?!!!!") These athletes are the best of the best from all over the world. Even with the best physical training and mindset, does any one athlete have complete control over every aspect of competition? Certainly greater conditioning, better strategy, more confidence, an ability to focus, relax and do what they do best can give athletes an edge. An edge. Not a guarantee. With every athlete facing the same external conditions, it comes down to individual performance on that day, at that time. Julia Mancuso, a favorite in the women's downhill, finished eighth. She said of the combined less-than-stellar showing of her team, "...There's really only three spots where you can get a medal, and there's tons of skiers out here who can really step it up and have their best races." Anyone, any day. Not to say that all of Team USA's performances have been epic failures. In many sports where the difference between medal and empty hands can be hundredths of a second or point, these athletes are faring quite well. I would be remiss if I did not emphasize, though, that the mental game is a huge component, particularly in situations where external forces beyond individual's control are in play (i.e., weather, course conditions, media intrusion, subjective scoring). All of the athletes need to put everything in perspective. Favorites should try to manage others' expectations in their minds, and not get caught up in the media spectacle. Up-and-comers should remind themselves that every Olympics brings stories of great surprise medal-winning performances. When it comes to the actual performance, though, the focus needs to be solely on the race or the short-program or the game, relying on the comfort that training has provided. The knowledge that they have prepared physically as well as they possibly could, and hopefully have prepared for all of the "what if" scenarios they can't control, so they know how to handle anything that is thrown in their path, should give the athletes peace of mind. No matter the external conditions, the athlete's ultimate performance in those conditions is completely within their control at this point. They can be assured of performing at their personal best if they can keep the right mindset. Will their best be enough to medal? Again, nothing is for certain. Success is doing what you know how to do, the best way you know how. When it's their turn to perform, all that is left is to quiet the mind, take a deep breath and just do it. On any given Olympic day, anyone can win.